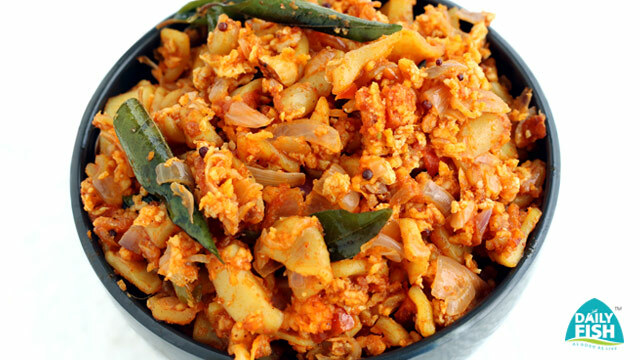 Squid thoran is a tasty side dish that goes well with rice and Kerala style curries. Defrost the squid as per instructions and cut them into small pieces. Now mix chilli powder, turmeric powder, pepper powder, coriander powder, garam masala, salt and ginger garlic paste and keep it aside. 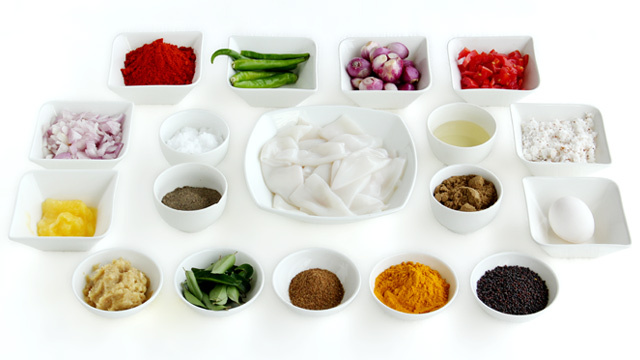 In a cooker, add this mixture along with squid and ½ cup water and cook till 3 whistle. If there is water keep it in fire and fry till it becomes dry. In a pan pour 2 tbsp of oil and slightly fry the squids and keep aside. In the same pan put mustard seeds and let it splutter. Now add onions, shallots, green chillies and curry leaves and sauté for sometime. Add eggs and scramble it. When it is done add the fried squids, grated coconut, ghee and salt to taste. Sauté well and remove from fire. Serve hot.